COVENTRY’S spectacular medieval guildhall and its priceless treasures are at risk of being destroyed by fire by reckless waste storage in a conversation area, heritage groups are warning. Preservation group The Coventry Society and Roger Bailey, city tourist guide and councillor, are among those highlighting what they say is a dangerous threat to the 760-year-old St Mary’s Guildhall, next to the cathedral ruins in Bayley Lane. The Coventry Society said: “The problem started when the food outlets in and around Castle Court changed their contracts for waste collection. “Where there had previously been small bins kept neatly in hidden away bin stores, the new contract was for very large skips on wheels. “These would not fit in the existing bin stores and the new waste company would only pick up the waste from the road side. 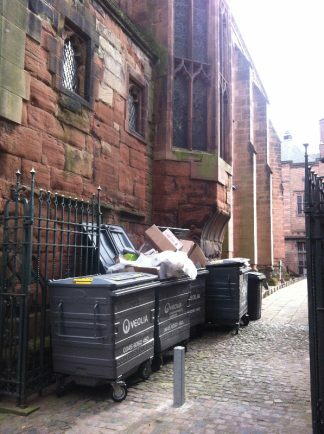 “When the bins are full they are to heavy to push by small catering staff, so the skips stay by the entrance to Castle Yard looking like a ugly mess and causing a danger. “This is a Conservation Area and is a very historic place which is frequented by tourists. The problem has been reported to the council and they did visit the site. “Council officers accepted assurances that the problem would not recur but nothing has changed. A staff member called ‘Dee’ wrote on Coventry Society’s blog about the issue: “I speak for all heritage staff within our beautiful building when I say that we truly love our place of work,we are dedicated to its protection and we take our position as hallkeepers, and custodians very seriously. The Great Hall houses the Coventry Tapestry masterpiece, stained glass windows, an ornate ceiling, and life-size portraits. Expert Dr Jonathan Foyle has pointed to the Coventry Tapestry being older than those in Hampton Court, while another hidden treasure was its preserved medieval window depicting kings of England. Coventry’s Guildhall was also once the seat of the Royal Parliament in the 1400s, when Henry VI fled to Coventry in the War of the Roses. The Observer has approached Coventry City Council for a response.